When I was little, I competed with friends in holding our breath underwater. One of us, who had an underwater clock – the envy of all – was timing us. Because fatigue interfered, it was almost impossible to beat your record on the spot, especially in the same day. Then winter came and we could not improve our records. So one of us invented a competition to see who could keep their finger in a glass of ice water longer. I took out ice cubes from the freezer, filled up a glass with water, and we placed our fingers in the water, watching one another intently. I do not know how we escaped without frostbite, but I do not advise anyone to do such a thing! The games children invent when their parents aren’t home! Those were the days! And here, over decades, I found Wim Hof, aptly nicknamed Iceman, the man who can stand for hours in water filled with ice cubes. And that’s nothing. Read on and let us marvel at the performance of this truly extraordinary man! 2 Who Is the Iceman? 3 What Does Wim Hof Do to Not Freeze? 6 Let’s Take a Polar Bear and Put Him in the Desert! 7 How Is This Useful to Me? If you are a person who’s usually chilly, especially females, I advise you to read the following with a blanket covering your feet. Or even completely cover yourself under the blanket. Or read it in the summer. Wim Hof, this truly hairless polar bear, found that each of us has a temperature adjustment knob in our heads. Kind of like for central heating, you set it to warmer or colder. Not wanting to await the invention of some kind of ointment that, when applied to the body, allows you to swim in cold waters without problems, he discovered, but especially put it into practice, the amazing power of the human brain. This incredible Dutch can successfully cope with the extreme cold. 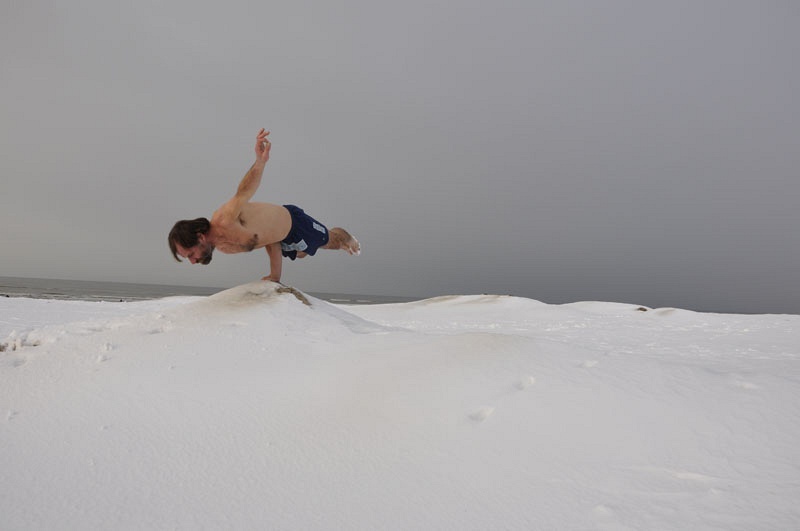 And not only can Wim Hof stand the cold, but he can do it for long periods of time. To run a marathon dressed only in shorts and with nothing on your feet, doesn’t seem like a big deal. But if the marathon is in Northern Finland, beyond the Arctic Circle, and outside temperatures are minus 20 degrees Celsius, then it is something that makes you ask yourself whether you are dealing with a man or a being from another planet! Wim Hof’s first attempt was in January 1999, where he ran half of the marathon. But he wasn’t pleased with himself. In 2009, he managed to walk all 42 kilometers. 5 hours and 25 minutes of running barefoot in iced snow! After 60 minutes, a normal person would lose consciousness. After the marathon, Wim Hof was in danger of losing his toes, as they had not received blood for an hour. Although the chances of blood being able to return to his toes were almost null and void, according to doctors, Iceman managed to bring life back to the frozen tissues without any scientific explanation. Born on April 20, 1959, in the town of Sittard, the Netherlands, Wim Hof had his first meeting with the cold when he was 7 years old. While going to school, he had to face frosty times. Tired, he curled up on the porch of a house and lost consciousness. If someone would not have found him and called an ambulance, certainly he would have met his end. Not only did the cold not kill him, but he found an inexplicable attraction to the extreme cold. From adolescence, he took brief ice baths, a practice that has many followers in the Northern countries (as well as other countries). He noted that he can improve the time in which he sits in cold water by certain mental states, which aroused his curiosity. His passion for cold increased with time. But the decisive moment was when the young Wim felt unstoppable impetus: to run barefoot on a snowy field, until his feet started to burn. The experience lasted only half a minute – enough to change his life. The feeling was very painful and equally extraordinary, as he confessed later. He liked it so much that he did it every day. This was only the beginning, because once he discovered his ability to generate “internal heat” by will, under deadly conditions, Iceman committed extreme acts. In order to improve his resilience to cold, the former postal worker Wim Hof trains in a butchers’ cold room at temperatures of -20 degrees Celsius and in winter, bathing in a river in the middle of the night, as to not be disturbed by locals. What Does Wim Hof Do to Not Freeze? Dr. Ken Kamler, hypothermia treatment specialist who dealt with several members of expeditions in harsh conditions, was intrigued when he learned about the Iceman’s performance. He speculated that Wim Hof uses the same mechanism that the human brain automatically uses to enhance heartbeat when you’re scared. In scare case, the brain commands, by nerve impulses, an increase in heart rate in order to cope with it – to fight with the bear or to flee. In Wim Hof’s case, to withstand cold. If you ask Wim Hof what his secret is, you will probably learn about tummo, a Tibetan meditation technique that gives you control over body functions. He learned about tummo from one of his brothers, who had participated in a climbing expedition in Tibet. Wim studied on his own and developed a similar method of training. He considers the Cold to be his true master. in the outer membrane of the cell wall of Gram-negative bacteria. Thus, simulating the infection was obtained without any real danger. Participants had fever, chills, and headaches; thus, proving the immune system reaction. When Wim Hof’s turn came, surprise! By concentration and meditation, he managed to halve the immune response, barely any symptoms were observed 1)”Research on ‘Iceman’ Wim Hof suggests that it may be possible to influence the autonomic nervous system and immune response“, article published in ScienceDaily. This is the result of a workout similar to Tibetan monks – which lasts no less than 12 years in the Himalayan monasteries. Wim Hof manages to directly influence the autonomic nervous system and the immune system. “Directly” meaning by will. He is able to raise the level of cortisol, the stress hormone that helps to bear stress, and to reduce the level of cytokines, proteins that are designed to improve the interaction between cells and favor communication between cells and even to influence cell behavior 2)”Cytokine” in Encyclopædia Britannica. So, here, I introduce you to a science fiction movie, whose main hero is an ordinary man who is self-changing at the cellular level! Only in this film, there was no special effects team. The actor did, what seems like, the impossible. Still it is possible. Even for you! In 2014, 12 volunteers trained by Wim Hof for just 10 days were compared to 12 other people without the same workout. The study, performed by Radboud University, shows that Wim Hof’s method allows anyone, through accessible training (meditation techniques, breathing, and exposure to cold), to control their autonomic nervous system and immune system 3)”Voluntary activation of the sympathetic nervous system and attenuation of the innate immune response in humans” – study by Matthijs Kox, Lucas T. van Eijk, Jelle Zwaaga, Joanne van den Wildenberg, Fred C.G.J. Sweep, Johannes G. van der Hoeven, and Peter Pickkers. The research results are important for all those who want to be healthier, but especially for those with autoimmune diseases, such as rheumatism 4)”Modulating your immune response“, news published on the site Radboud UMC on May 8, 2014. A person so trained, takes temporary conscious control of some body functions, which usually are related to the subconscious. So you can tell your body exactly what you want it to do, instead of the primary reaction. You are the master of the animal in you – the trainer of your self! In February 2009, Iceman climbed, dressed only in shorts – perhaps for decency – up to Mount Kilimanjaro, Uhuru Peak, Tanzania. At 5895 meters altitude, on a cold day, at -15 degrees Celsius – he feels at home! Subsequently, Kilimanjaro has become one of his favorite places. On January 24, 2014, he set a record: an ascent in just 48 hours, with a group of 26 participants, who are taking his courses to improve resistance to cold. And this record was broken on 14th, January 2015: only 31 hours and 25 minutes, with a group of 18 students without any climbing experience, one of them suffering from rheumatism. The group went shirtless up to Kibo hut, but the bad weather forced them to dress, to not risk the health of the least trained ones. Wim Hof repeated the mountain experiences in the Alps, too, where he ran a half-marathon several times at 3500 meters altitude. Stripped of course! In 2007, you would have found him at 7315 meters altitude, on Mount Everest, almost naked, only in shorts and sandals! He did not make it to the top of the world because his legs were affected by frostbite. Would you say it’s a failure?! In 2008, he stayed submerged in water that was filled with ice cubes for exactly one hour, 13 minutes, and 48 seconds. Like a good wine in an ice bucket. The record was recorded in The Guinness Book of Records under the astonished eyes of hundreds of spectators and millions of TV viewers. Tokyo 2010, he broke his own record. This time he spent an hour and 44 minutes. As you can imagine, the Japanese were in shock and exclaimed: oaa! Did he stop here? No. 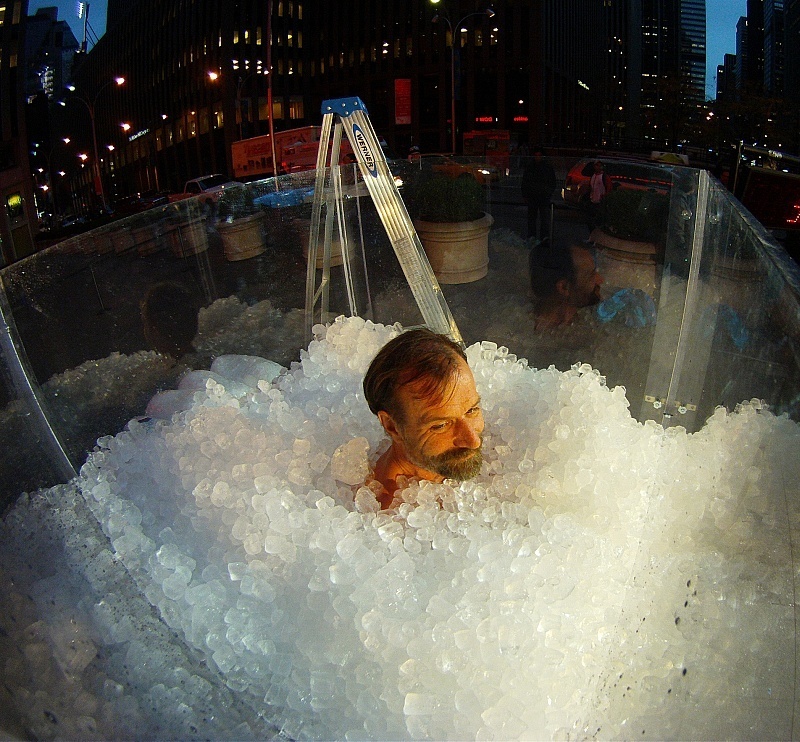 In 2011, Wim Hof exceeded twice the previous record, in Germany and in the USA. The Guinness World Records shows in 2015: one hour, 52 minutes, and 42 seconds in ice water. In fact, Wim Hof holds the record registered by Guinness World Records in 2000 for underwater swimming, where he swam under the ice from one hole to another, without a protective suit. “Only” 60 meters beyond the Arctic Circle. He can hold his breath for up to 6 minutes, but the water was so cold that it froze his goggles and he had difficulties finding the exit. Let’s Take a Polar Bear and Put Him in the Desert! I’m already super jealous of this man, seeing that the news of the Gcal price rises leave him cool. 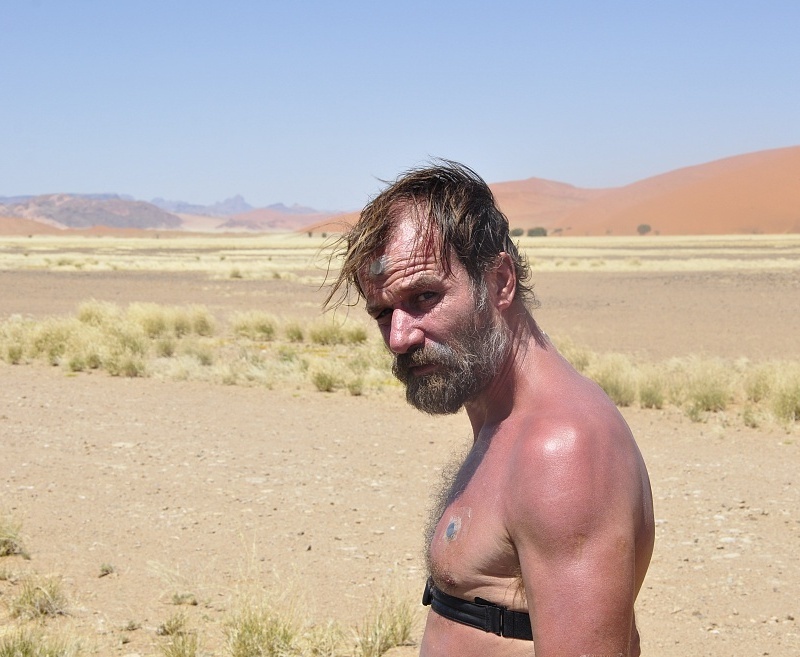 So I will send him a mischievous message: Let me see you in the desert, Wim Hof, what will you do there?! But, alas! I read with amazement that in September 2011, under the supervision of Dr. Thijs Eijsvogels, Iceman ran a full marathon in the Namib Desert, South Africa. Daytime temperatures were exceeding 45 degrees Celsius in the shade – if you find shade somewhere 5)”Dryland Climatology” by Sharon E. Nicholson, book published by Cambridge University Press in 2011. In order for this not to be a piece of cake, he never drank any water, not even a drop. He reached the finish line with 6 kg less 6)”Burning man: Adventurer loses 14lbs as he completes marathon in 40C Nambia without touching a drop of water” by Craig MacKenzie, article published in Daily Mail on December 9, 2011. Does anyone need a quick diet?! Wim Hof has proved that his method not only improves the resistance to cold, but also any resistance. He just loves the cold! A normal man, who has quilts of different thicknesses in his closet and changes them depending on the forecast, wonders what he would use if he had an increased resistance to cold. When interviewed by the descent from Everest, Wim Hof said simply: “It was pretty easy.” Yes, it seems easy for him! Let us remember that he worked on this for a lifetime. But who knows, maybe the next “Iceman” is training right now or will start tomorrow. Good luck! Let us read this article in the warmth of our home, but to judge from the cold: it can be done! 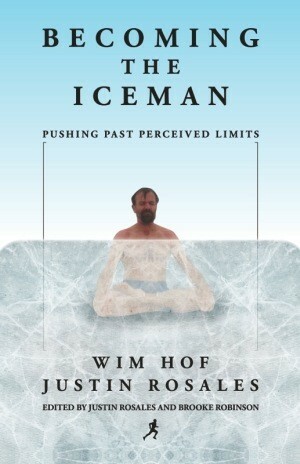 Wim Hof wrote a book about him and the ways in which he follows. He regularly organizes courses. He participates in conferences, each time with a clear and simple message. A quick summary of it in a few short words would be: you can reach something with special training and specific exercises. It’s not a miracle, we are not dealing with any alien or who knows what mutant. I was about to write “simply you must train”, but let us not forget that he has a method. Do not try this at home, as they say, and do not jump first in the glass of water out of the freezer! Wim Hof is the one who managed to carry on the experiment the farthest. He is the top. There are many others in the world that bathe in icewater, live in the cold, or are resistant to a cold that would kill anyone else. To be understood exactly, and do not confuse cause with the effect: all these people have good health through exercise they did not vice versa. Even if you think that you have strong health, this doesn’t mean that you can stay in ice-cold water without any training. However, making the water colder each time you take a bath, can offer you, over time, better health. I will do this starting today, in order to try to bring this world as close as it can be to me, which now I look at with wonder. We thank Wim Hof and his team for the kindness to provide material to illustrate this article. More information about Wim Hof and his activities are available on the official website: Innerfire.